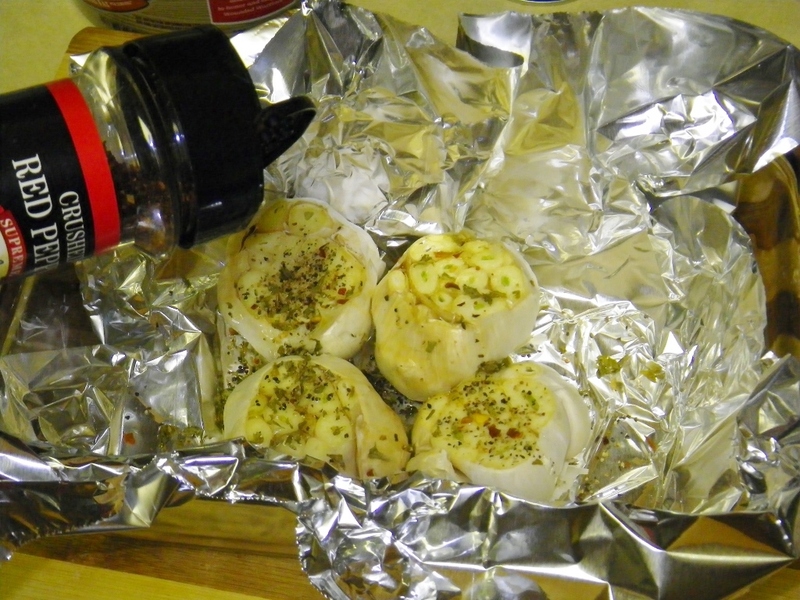 Roasted garlic is a regal condiment and spice for your food preparation. This recipe makes ½ pint of roasted garlic cloves. They will keep safely for about a week in your refrigerator. Adjust size of recipe to make just the amount of roasted garlic you will need for the coming week. 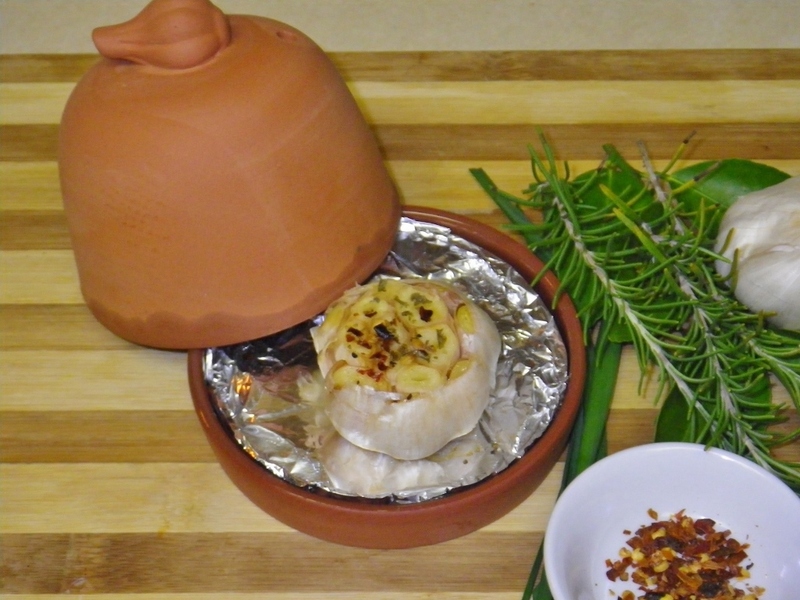 For immediate use, a terra cotta garlic roaster works well for 1 large or 2 small heads of garlic. 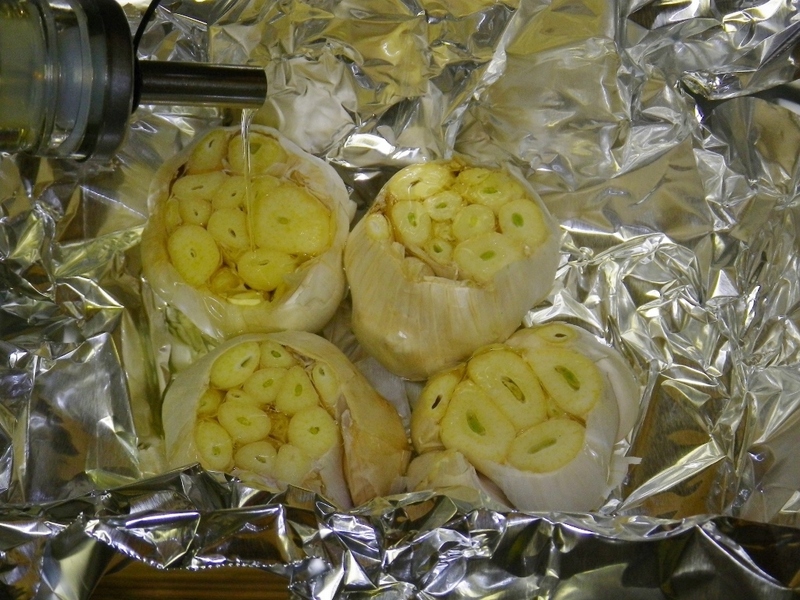 For larger batches, 4 or 5 heads of garlic, us a small roasting pan with foil to wrap the garlic heads. Rub garlic heads in your hands to loosen the outer layers of skin. Peel the skin leaving the tightly clinging skin in place. Hold garlic head firmly in place, on its side. 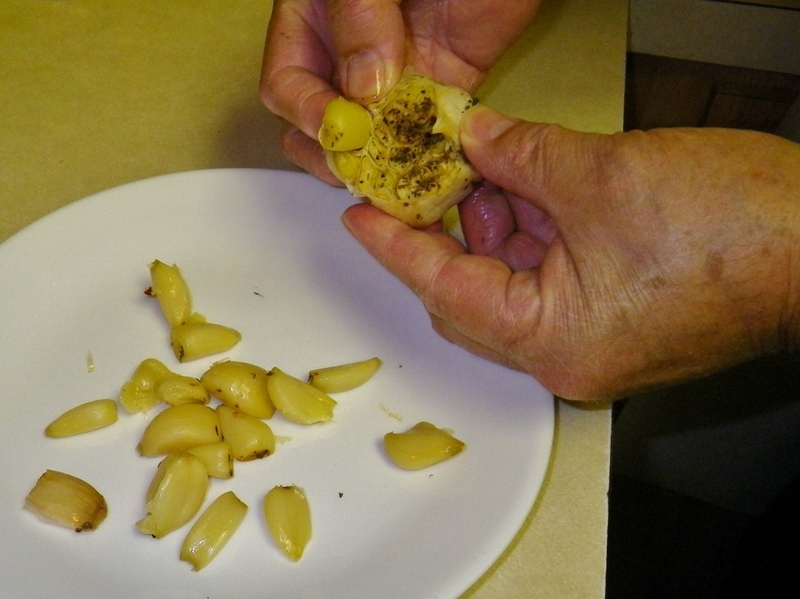 Carefully cut flowering end (opposite the root end) to expose the garlic cloves inside. The garlic skin is slick and can slide easily across your cutting surface; use a slicing motion rather than a chopping motion. 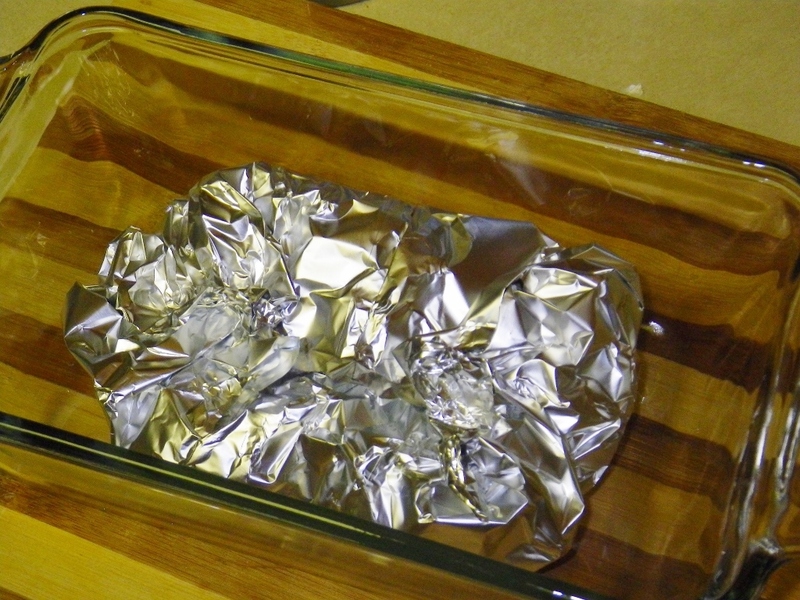 Place a sheet of aluminum foil across a small baking dish. Push the foil down into the dish. Arrange the garlic heads on the foil in the dish. Drizzle with olive oil letting the oil flow between the individual cloves. You may have to wiggle the cloves a bit to let the oil flow. 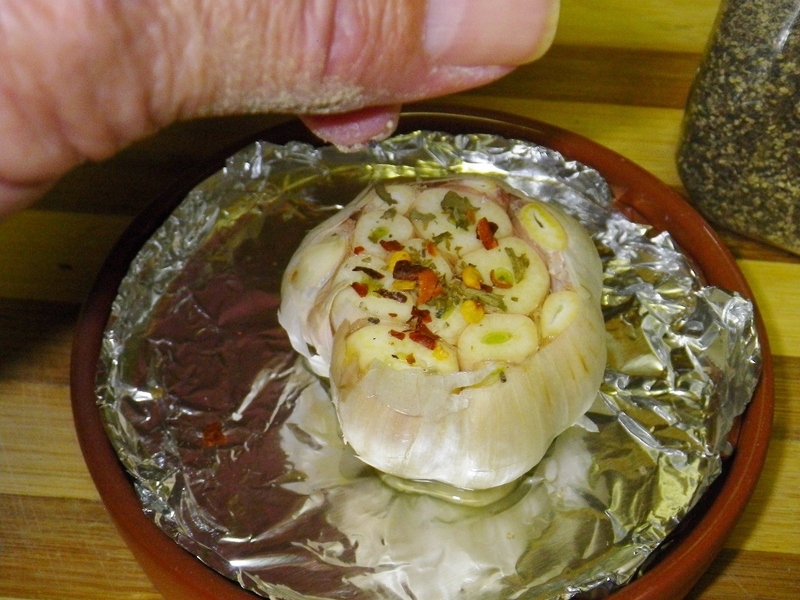 Pull the edges of the foil up and fold to seal the garlic heads inside the foil. To season or not is a personal choice. Common seasonings used are salt, pepper, oregano, rosemary, basil and red pepper flakes. 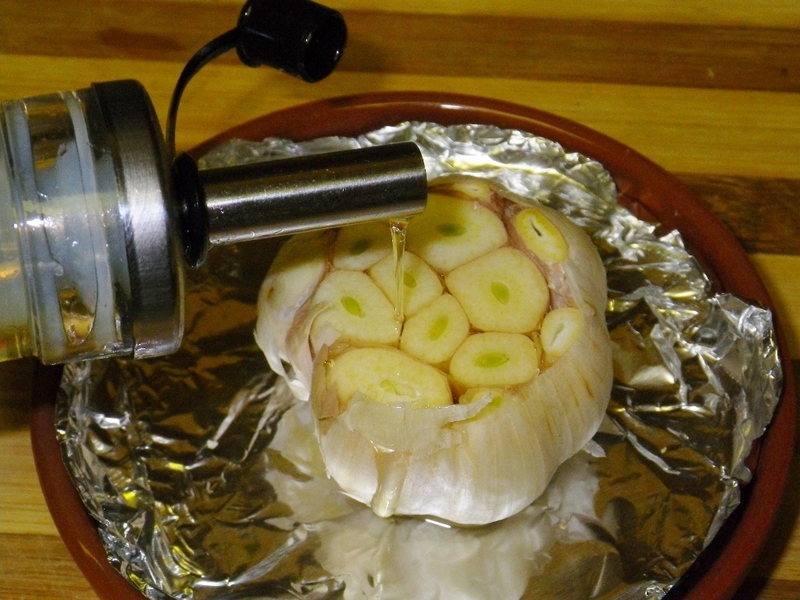 Bake in a preheated 350° oven for 40 to 50 minutes or until a sharp knife easily pierces the garlic head. Remove from the oven and allow to cool until safe to touch. Reserve the cooking olive oil for later use. Here comes the messy part: Hold the cooled garlic heads, cut side down, over a bowl. 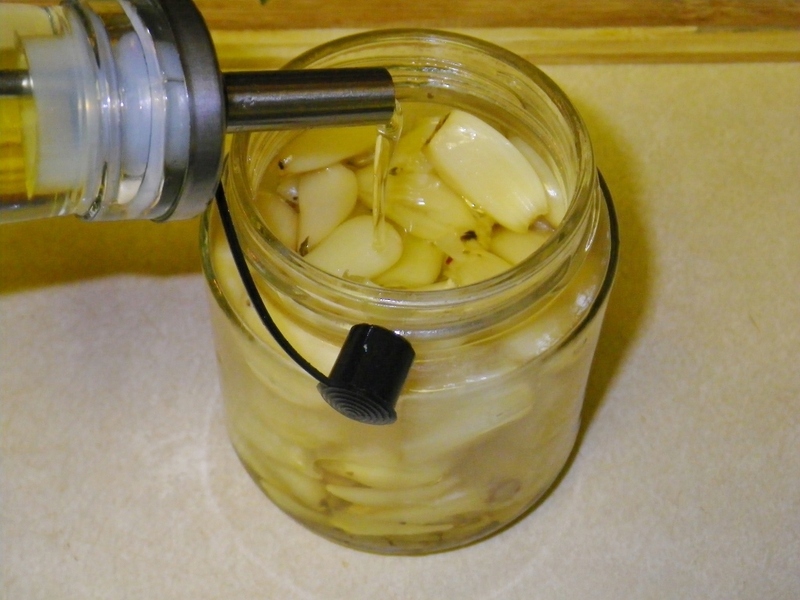 Gently squeeze the head and the cloves will usually pop out. Sometimes it is necessary to make slits with a knife to let the cloves slide out. Leave the cloves intact until ready to use. Dice or mince as needed – a garlic press works just fine. To make a garlic puree, chop the garlic cloves on a smooth cutting board. 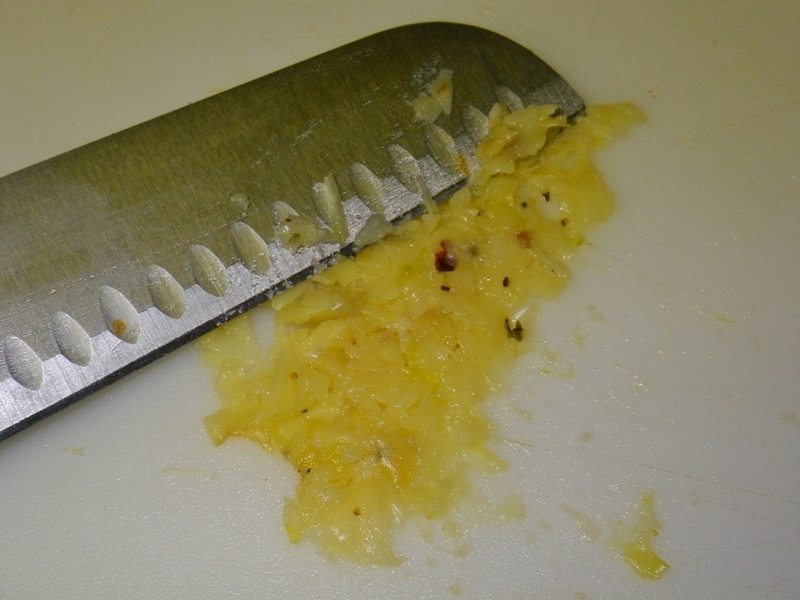 Then use the knife, pulling the edge, at an angle, across the garlic to make a finer and finer puree. You can store the unused cloves of garlic safely for a week in the refrigerator; any longer and they will need to be frozen. Place in a clean jar with a closeable lid. Place the cloves in the jar, add the reserved olive oil from the cooking. Add additional olive oil to just cover the garlic cloves. The olive oil will gel slightly in the reffrigerator. Small terra cotta garlic roasters, there are many different designs, work well. Their directions may differ from these. Use foil to help with the cleanup. The terra cotta roaster is us in a cold oven to start. Soak the cover in cool water for 15 to minutes before roasting the garlic heads. 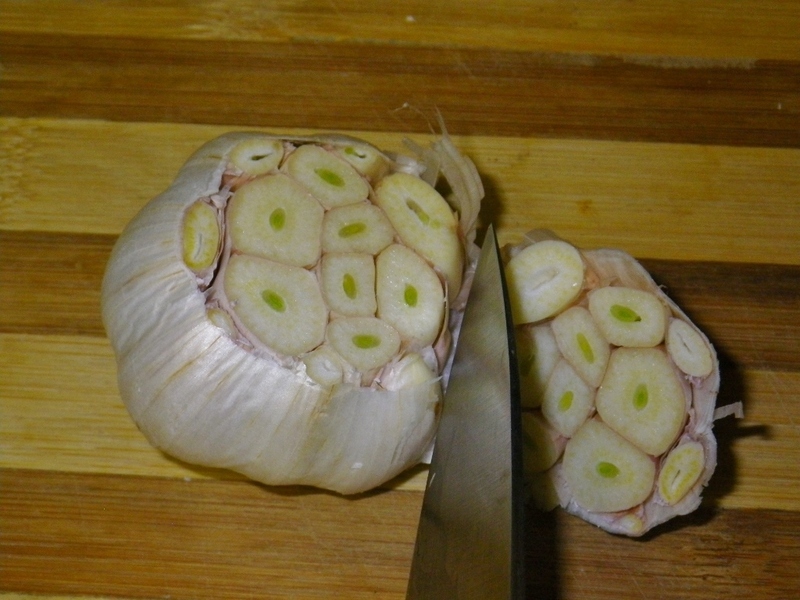 Cut the tops off of 1 large or 2 small heads of garlic as above. Drizzle with olive oil letting the olive oil seep between the cloves. Season if desired. Cover with the dampened cover. Place in a cold oven and heat to 325° and roast the garlic for 45 minutes. 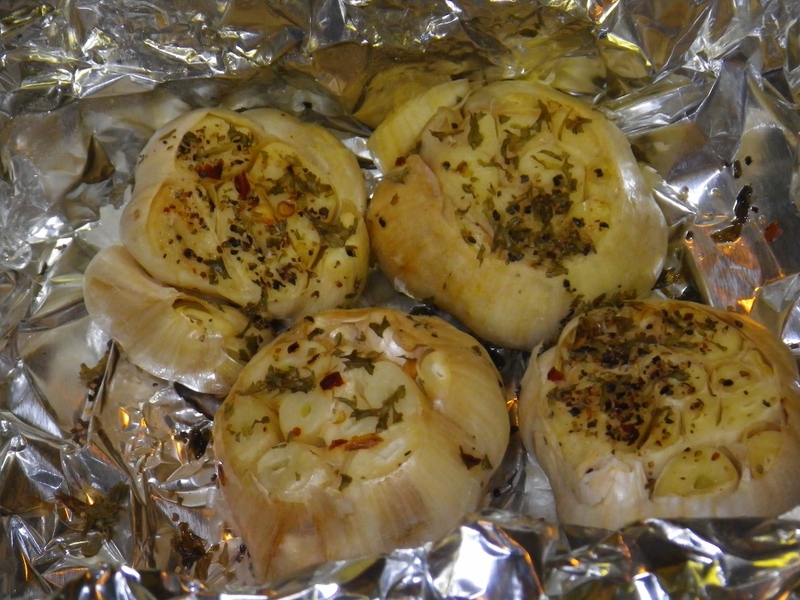 Remove from oven and allow to cool completely before handling the garlic heads.